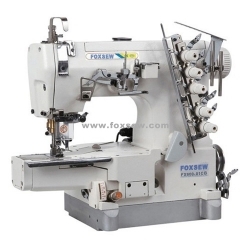 Applicable to general sewing of knit wear, sports wear and leisure suits. 2)New type needle bar oil-back system, no possibility of oil leakage. 3)Needle bar transmission structure, adopt all-sealed design, more safe and easier to keep clean. 4)Complete automatic supply system and oil-filter device, ensure the max sewing speed to be 6000r.p.m. 5)Some key parts are imported from Japan, which enhance the wear-resistance of the machine.